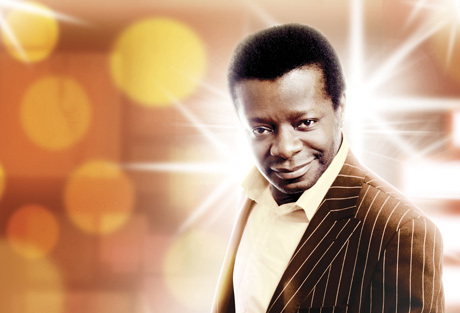 On Saturday February 20th 2010 I saw Stephen K Amos live at the Warwick Arts Centre. Appropriately named “The Feelgood Factor” this was a show full of energy, non stop laughs, and lots of audience engagement. A real event from a charming comedian who oozes confidence and is still on the rise. 9/10, must see if you get the chance. First to the stage for a 30 minute crowd warm up was a young comedian called Seann Walsh, I’d heard his name before but knew nothing of him, and was just expecting a quick 10 minute giggle from a part-time comedian. How wrong I was! He was funny from start to finish. Observational comedy which covered tripping over stuff, being drunk, and what kind of a person doesn’t use an airport travelator and walks to the side of it! The humour appeared to get more laughs from the younger people in the room (judging by laughs from those around me) but nonetheless topics everyone can relate to. So Seann Walsh is certainly one to look out, remember the name. The lights went off and the room waited in suspense, a pause, and suddenly a series of glitter balls on the stage start to dance, the smoke machines begin and the Beyonce track ‘All The Single Ladies’ fires up loud – out emerges Stephen K Amos with dance moves even Mrs Jay-Z herself would be proud of! He began by mentioning this gig was near the end of his tour, to which a series of jokes about other areas of the country rolled out, to which Telford got a bit of a spanking. I’m not a huge fan of comedians constantly taking the piss out of other areas of the country, for me it is just an incredibly easy target and is very unoriginal. Nonetheless the material was funny and it only lasted about 5-10 minutes. Then came the usual front row jibes, we had a 17 year old with his family, “you will learn there is an age when you stop going out with your parents”, a group of young lads from Kenilworth “the pheasants escaped!”, and an unsuspecting chap who Stephen made take his jacket off (even though I myself was quite cold in the hall!). Other crowd fun included when he asked for a show of hands on ‘who here came to the gig last year?’, to which the sell out crowd of 1,500 fell silent. So he asked again, this time with a noise, but absolute silence descended. Only a live gig can provide comedy gold like this, Stephen genuinely found this hilarious! The whole gig was a joke fest entwined with audience interaction, a blend which makes it ever so much more unpredictable and enjoyable. He also slowed it down half way through, telling about when his friend had cancer and he made the decision to become a comedian, a very endearing moment which actually fitted in well with the whole show. Wrapped around all the fun you got a real sense that Stephen himself had a good time. Even laughing at plenty of his own jokes (which he admitted) during the crowd interaction, I do warm to comedians who have this style and it certainly makes it feel uber relaxed and a real pleasure to be there. I myself had to shoot off as soon as it ended, but Stephen did stay behind in the Warwick Arts Centre to meet and greet fans for autographs and general chit chats. I thought this was great, showing a real respect towards fans. And as a fan personal interaction is always something special, and definitely a story to tell the lads down the pub (and the family, friends, postman, milkman + the cat, dog and old lady next door!). I would give the gig 9/10. A charming character who has his own style and works the whole event beautifully, mixing audience interaction with prepared jokes. And amongst all of that you get a feeling for the man, something I rarely experience with other comedians, for me this gives it that something extra. He is a definite must see when you get the chance!